The equine residents of Hope Pastures Rescue Centre demonstrate how to decorate for the holidays. brighten up the darkest days of the year, regardless of which seasonal holiday you celebrate. But why should the humans have all the fun? 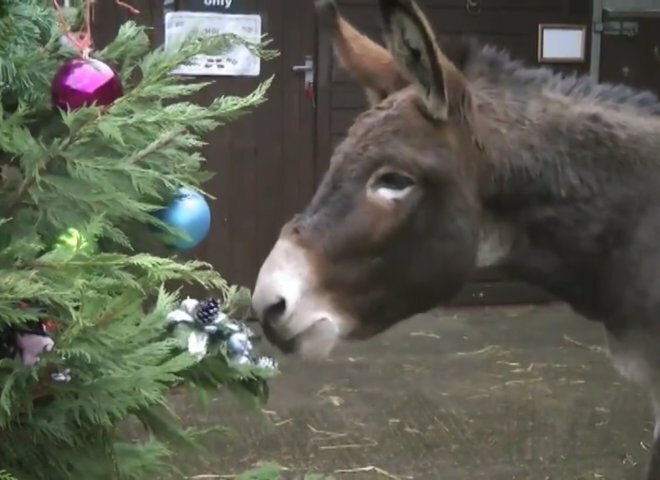 The ponies and donkeys in today’s video are doing a great job decorating their stable’s Christmas tree. them at the tree with reckless abandon? (See the action at the 0:40 mark of the video.) Do you have a ton of gifts to arrange under the tree? These guys can help you out, with a little encouragement. This festive scene is more than just another cute animal video. The ponies and donkeys are residents of Hope Pastures Rescue Centre in Leeds, England. Some of them come with histories of abuse and are often fearful of humans. 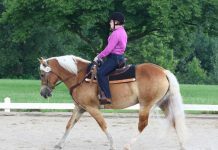 Working with trainers from Connection Training, the staff at Hope Pastures earn the trust of their four-legged charges. 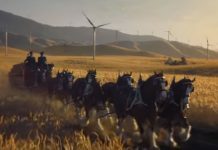 By learning the tricks seen in this video, the horses’ and donkeys’ natural curiosity shines through. Hope Pastures not only rescues and rehabilitates horses, ponies, and donkeys, but they are open to the public with free admission throughout the year so that people can learn more about the animals and learn about caring for equines. Find out more about hopepastures.org, and learn more about Connection Training at connectiontraining.com. Just awesome and beautiful and they know what they’re doing! Great job equines! OMG this is just adorable and thank you for doing such a great job to rehabilitate these poor babies! If I lived there, I would visit for sure and help with them! Oh this is so cute! Love the gray that puts the presents under the tree! Actually they all are adorable and well trained to decorate! Very nice, can they come help me at my house! As cute as it comes. Glad Bango is not so shy any more. How adorably cute! Are they for hire! I could use help with my tree! Whinny Whinny! Oh what a great job, do you give lesson, my grandkids could use some help! Just adorable! Loved them all! Very talented, could they teach my dogs to help out and all my rescues horses too! How adorable, have to see if mine would carry those ornaments without breaking them!